Arm is 9 inches long. Allows movement at any of the two connections shown. Note: Arm locks into place once adjusted. To readjust, simply loosen the wing nut and move to desired position. This feature is perfect for parents with kids. You can simply move the shower head up or down to the desired level, allowing you to put the water flow where you need it. Designed to give maximize pressure as if standing in a hard rain. 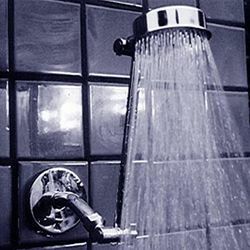 This is our most popular shower head which we have sold for over 11 years at fairs and home shows around the country. Those who purchase it usually come back for a second or even third purchase. 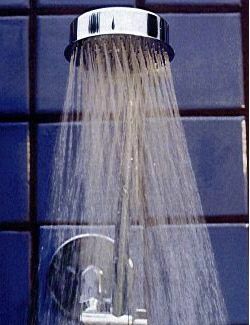 Shower Head design is common in Australia and Europe. Other companies market similar showers as "The Wonder Shower" or "World's Greatest Shower Head". Just try it once and you will be convinced! Note: Shower Head is designed to turn 360 degrees in any direction. It is perfect for cleaning your shower walls. Disclaimer: Actual output will vary, depending on your individual water pressure. 5 GPM based on 35 PSI.